This is the final part. The future. With Episode 13 having now been posted to WattPad, it's easy enough to recap here. Qiilura over, the mission to Forsaad can now take place. The idea was to put DarkRula on the spot, and force his hand in being cut off from the Jedi. It was also a way to introduce two sisters we'll be seeing more of later. Lei'sa and So'lei are Twi'lek bounty hunters who are able to use the Force. They aren't Jedi, so they've had to teach themselves to use those powers. These two have taken the Federation up on their bounty, and with their help storms the Jedi base on Forsaad. The intention is to get the location of the Jedi main base - Ilum. This is all part of the war between the Jedi and the Federation of which both sides have been avoiding discussing with DarkRula. While I can't say the details - they will come at the end of this series - I can say that it will cause DarkRula to do something he has been holding back on doing. So, with DarkRula and The Doctor performing upgrades to all the equipment and droids on The Ark, they are out of the action for the time being. Which gives us time to catch up on what the Daleks have been doing. When we left them last, Dalek Rizon had forced Thalos into a lesser role with himself the new leader of Tatooine. Dalek Zane and Volk had stormed Cyrillia with the help of the Mandalorians to capture the human to droid technology. We will see the outcome of this, as the Daleks make plans to increase their strength by adding to their numbers. Once they can work out all the problems with it. All of the Daleks are therefore on Tatooine, along with the Mandalorians. Since the TARDIS malfunctions again, DarkRula never knows this. All he knows is that a third Dalek leader has been on the planet, and at the end of Hide and Seek has rejoined the others. Hide and Seek will also be going deeper into some of the events from the audio episode. Before DarkRula and The Doctor part ways until Endor, The Doctor makes a request. He wants to know what happened before he arrived. Where the Daleks arrived and what they did during DarkRula's first encounter with them. A journey with the two in the Scimitar follows, with the exact same journey taken as Kronis and DarkRula had taken those many weeks ago. Coruscant, Fresia, Byss and Empress Teta are all visited, with DarkRula explaining the action that happened at each place. I'm not just going to stay in the past with this arc though, as current events will happen as well. I'm not going to say anything else on that. The next major thing to happen would be the jump to audio episode four. As I explained, this would be split into it's original four and five episode names, essentially making up two episodes. In Dark Descents we have The Doctor returning to The Ark with the location of where the Daleks are hiding. Once they arrive at Endor, the start of the battle will be told from the other side. The Mandalorians boarding The Ark. It also gives a better chance to see Krayt Skirata's thoughts on the matter at hand. In the audio series, we don't really get to see much at all about why Skirata would change sides, other than the fact Kronis was friends with him. Within Dark Descents, we'll see the action from his side, his wondering at what the Daleks have caused him, and sudden realisation that he should help destroy them instead of helping them. That doesn't mean we won't have time for the battle between DarkRula and The Doctor. With Final Throwdown, DarkRula and The Doctor head down to Endor in the Scimitar, hoping to find the TARDIS and stop the Daleks once and for all. Down on the surface, and again from Skirata's viewpoint, we see the Scimitar crash down on the surface near the entrance to the base. The talk between Skirata, DarkRula and The Doctor happens, with Skirata finally admitting to himself and to others that he wants nothing more to do with the Daleks. After giving the warning, he jets off. The viewpoint is now on The Doctor as a revelation is to come. Dalek Zane corners them in the generator room of the base, where preparations have now been finished. The Doctor and DarkRula find a turbolaser battery after Dalek Zane activates the start of the void creation sequence, and fires upon the cruiser of the Daleks. It gets pulled down to Endor, and is headed straight for the base. The void opens and claims the ship, defeat is in the air as a turbolaser gets fired, but that turbolaser fires into the void, restoring energy and closing up the void. The ending will be the same as what happens in the audio episode, though it will be from DarkRula's perspective. Some of the dialogue will be changed to reflect the new canonicity of events, and that is the end. DarkRula and The Doctor part ways. Except for one more thing. Upon cleaning through the base, DarkRula finds that it was once a sub base of the Jedi. While it might have been abandoned, it still had a live link to the Jedi main base. All of the information about the Jedi and Federation war from the archives of Master Tee Vol's journal is found by DarkRula. He shouldn't have been able to see that, so some Jedi Master had been there and left the link open. It never said why the base was abandoned, but the Jedi-Federation war was more important to DarkRula. The story of all of it is told here. And the final scene is of DarkRula vowing to give both the Jedi and Federation a war they will never forget. Once this has been finished, there will come a time where I revisit this universe to follow DarkRula on his new quest. However, I would want to take a break from the universe to try my hand at other things. The Chameleon Chronicles does have another side of the story, after all. That being from Sonic's perspective. I'll give more details on that when I get to it. 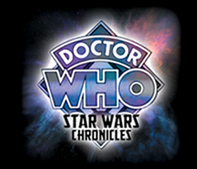 And with that, the Look Back, Look Ahead series of posts for Doctor Who: The Star Wars Chronicles is finished. With how many episodes are left to write, this series should be finished during the first half of next year. Look forward to them.